These programs run as WebJobs on a schedule (cron) or continuously. You can use the WebJobs SDK is to simplify the code you write for common tasks that a WebJob can perform, such as image processing, queue processing, RSS aggregation, file maintenance, and sending emails. 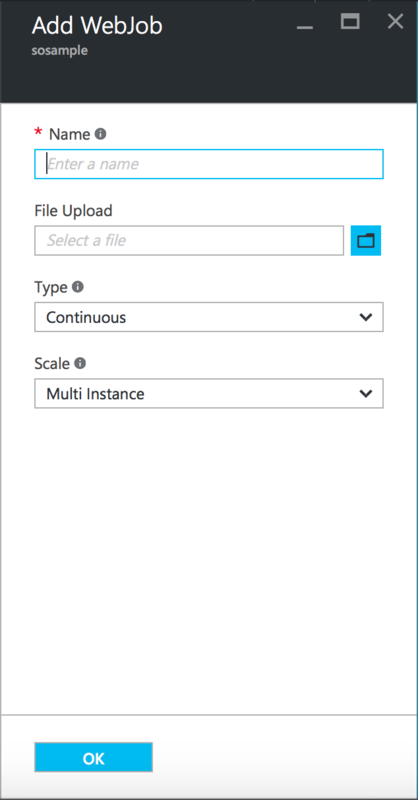 The WebJobs SDK has built-in features for working with Azure Storage and Service Bus, for scheduling tasks and handling errors, and for many other common scenarios. Click Add. The Add WebJob dialog appears. Under Name, provide a name for the WebJob. The name must start with a letter or a number and cannot contain any special characters other than "-" and "_". In the How to Run box, choose your preferred option Continuous or Triggered (the trigger can be using a cron schedule or a WebHook). In the File Upload box, click the folder icon and browse to the zip file that contains your script. The zip file should contain your executable (.exe .cmd .bat .sh .php .py .js) as well as any supporting files needed to run the program or script. Check Create to upload the script to your web app. The name you specified for the WebJob appears in the list on the WebJobs blade.